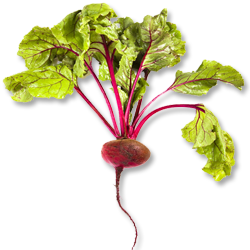 Beet root (Beta vulgaris) belongs to the Chenopodiaceae family and the crop requires cool moist weather for production and high yield. The high range regions of Kerala from August to January offer ample scope for its cultivation. Beetroot is essentially a cool weather crop but it can be grown in a moderately warm climate as it attains best colour, texture and quality in a cool weather condition. A temperature range of 18-21°C is considered as ideal for obtaining good quality roots, rich in sugar with intense red colour. When temperature goes below 10°C, bolting starts before the beets attain marketable size. Well drained sandy loam soils are best suited for the crop. A pH range of 6-7 is considered as best for getting optimum yield. The ideal planting season for beetroot is from August to January. Prepare the land to a deep friable condition to have least resistance to the root development. Incorporate well-decomposed FYM @ 20 t/ha during last ploughing. Recommended seed rate is 7 to 8 kg/ha. Pre-soaking of seeds for 12 hours in water facilitates better germination in the field. Before sowing, the seeds are treated with thiram or captan (2.5-3 g/kg of seed) to control pre-emergence damping off. It is usually grown on ridges to facilitate good root production. Ridges of about 20 cm height are formed 45 cm apart and seeds sown 15-20 cm apart on the rows. The seeds are mixed with fine sand and placed in rows by hand and covered with soil to make it firm around it. A light irrigation is given immediately after sowing. Hand thinning is done soon after the germination. Thinning is necessary to have root tubers of uniform shape and size by providing optimum space for uniform development of the root. Apply FYM 20 t/ha as basal. N:P2O5:K2O 75:37.5:37.5 kg/ha is recommended. Full dose of P2O5 and K2O and half dose of N are applied as basal. Remaining half dose of nitrogen is applied as topdressing when the plant starts growing vigorously. It is necessary that enough soil moisture is available to help uniform seed germination and growth of plant. Give a light irrigation soon after seed sowing to ensure good germination. The crop should be irrigated at an interval of 4-5 days in summer and 10-12 days in winter. Weeding should be done at regular intervals to keep down the weeds. Manual weeding is commonly practiced. Avoid deep cultivation as it may damage the crop. Earthling up is done to support the structure of the plant and to prevent the exposure of roots to sunlight. Earthing up should be done, when the root starts growing. Shallow hoeing is necessary to facilitate better root growth. The maggots feed in the epidermal layers of the leaf by making serpentine mines with silvery appearance. The affected leaves turn pale yellow, get distorted and crumpled; and gradually dry and die away. Control: Destroy fallen leaves and other plant debris after harvest. Web worms: Hymenia sp. or Loxostege sp. Green caterpillars web up the leaves and live inside the knotted mass. Flowering and pod formation is adversely affected. Control: Removal and destruction of webbed bunches of leaves help to check further spread of the disease. The caterpillars voraciously feed on the foliage causing severe damage. Control: Hand picking the larvae and spraying the crop with carbaryl (0.1%) controls the pest. Circular spots appear on the leaf surface, which later dry up giving a shot-hole appearance to the leaves. In case of severe infection, leaves dry and drop prematurely, exposing crown. Control: Removal and destruction of affected plants, crop rotation and spraying copper oxychloride (0.3 %) control the disease effectively. White powdery growth appears on the lower leaf surface. The affected leaf dries and shrivels quickly and infected flower shoots become stunted and distorted. Control: Phytosanitary measures, crop rotation and use of resistant cultivars are recommended. Seed treatment with thiram (2.5-3 g/kg of seed) and spraying dithane Z-78 (0.3 %) is also effective. The infected leaves show conspicuous mottling with chlorotic, zonate ring spots on the surface, and the plants remain stunted. Aphids spread the disease. Control: Destruction of infected plants and controlling the aphid population by spraying malathion (2ml/litre) prevents the spread of the disease. The infected plant parts become thickened, leathery and distorted. Infection impairs both yield and quality of the root. This disease is transmitted by beet leafhoppers. Control: Use of resistant varieties; eradication of susceptible weeds and volunteer crop plants; regulating the time of planting; use of trap crops, and malathion spray @ 2ml/litre to control leafhoppers population are recommended. Infected leaves become chlorotic, thickened, leathery and brittle. The foliage becomes abnormally red or yellow and often dies. This disease is transmitted mainly through aphids. Control: Remove infected plants and weeds from the field. Controlling aphid population reduce disease incidence. Purple leaf of beetroot: Tobacco mosaic virus (TMV). Plants become stunted and leaves show a tendency to stand erect and come closer. Leaves of infected plants show an unusual intense purple colouration. Control: Removal and destruction of virus-infected plants and weed hosts helps in minimizing disease. The beet root crop become ready for harvest within 60-75 days of sowing when the roots attain diameter of 3-5 cm. The roots are harvested before the development of spongy tissue within the roots. Usually the plants are pulled by hand and the tops are removed. 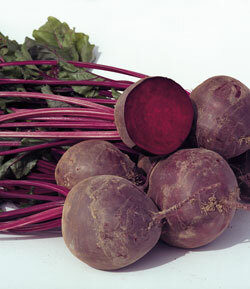 The average yield of beetroot varies from 20-25 t/ha.